To say it has been an eventful couple of months would be an understatement! It feels like it has been a non stop whirlwind of emotions lately. We have had highs and we have had a lot of lows, but throughout it all, we have had each other and that is the one constant thing that keeps us united, strong and undeterred – we are family – you are a part of our family and when you hold hands with us, you become a part of our never ending circle of strength – every crisis faced together, makes our circle stronger. The past hurts. You can run from it or learn from it…. Whichever path you chose, you have to keep going. There are beings depending on you, looking up to you and turning to you for strength and guidance. You can not let them down. Right?? Wrong!! I saw a very simple quote just days after losing our boys and it has really helped me move on from the angst. “You have to feel it, to heal it” – YES, you really do. 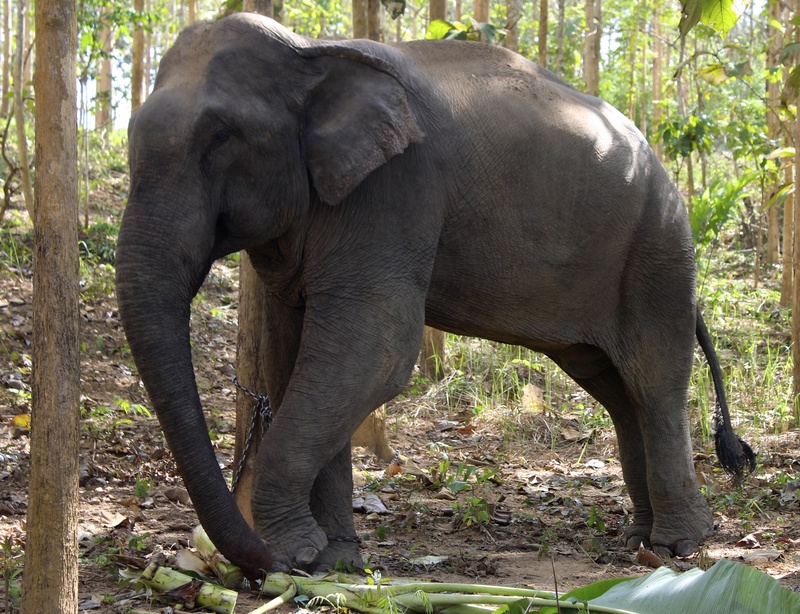 Lom has broken away from Pang Tong, seeking friendship and comfort from Thong Dee and Boon Thong, as well as spending an increased amount of time on her own. Pang Tong, has lost some weight and shows little interest in grazing out in the forest. 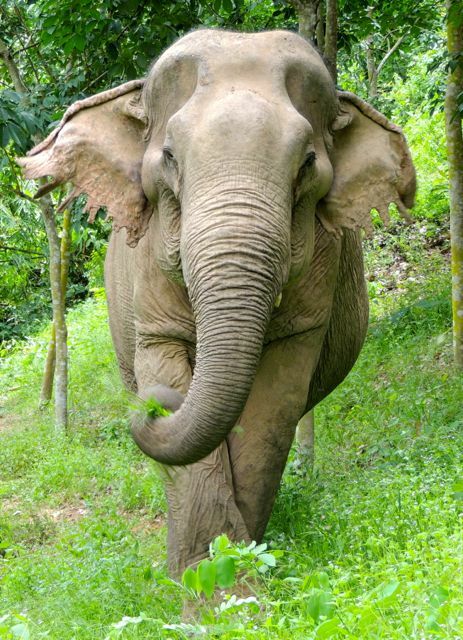 She seeks out Phi Lor, her trusty mahout of nine years and stays close to him during our daily walks… It is very upsetting to see Pang Tong, who has always been so strong, powerful and protective, showing signs of unhappiness and we hope that time will help ease her heartache. Mee Chok has become highly aggressive and has been attacking both Pang Tong and Lom, stabbing them with his one long tusk. Neither of the girls will push back on him and again, it is so sad to see this disruptive behaviour from our youngest elephant. Somai was a stable role model in Mee Chok’s life and always kept him in his place. Now, Mee Chok has lost that fatherly figure and it is obvious to us all, he is not sure how to behave now… Mee Chok has been spending an increased amount of time with Tong Jai, but Tong Jai does not have the same level of patience that Somai did. Needless to say, we are taking each day as it comes and helping each other move through the grief that still consumes us all. Somai was such an almighty and awesome bull and his presence is still hugely missed. The loss of Somai feels raw and very real for us all here and we want to thank you all for sending messages of condolences and support. They really do help ease the pain. The day that Somai passed, there was a dragonfly that hovered around his body, until he was buried. 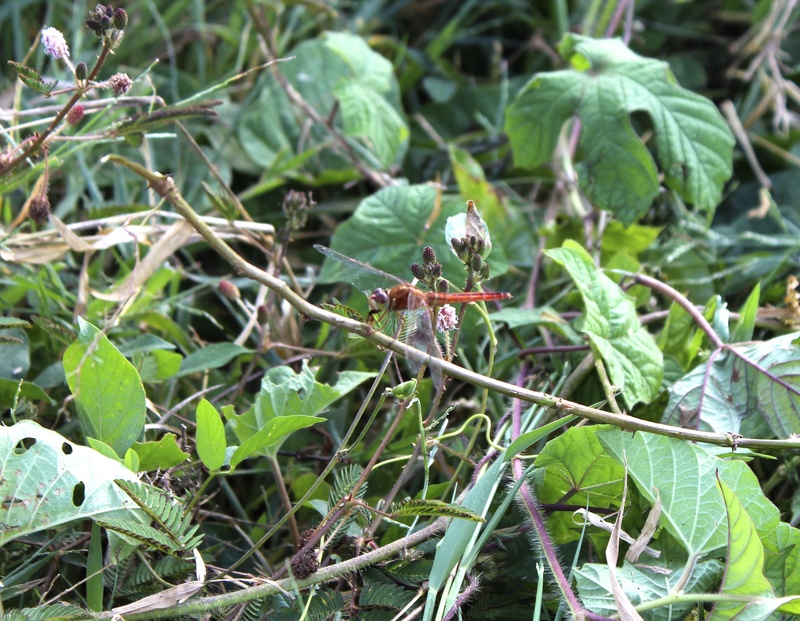 Since Somai’s burial, many of us have noticed and commented on the increased population of dragonflies around BLES. We are so thankful to all of you who believe in the Friend’s of Somai initiative just as much as we do and helped us reach our fundraising goal in record time. Together, you have enabled us to offer a forever home to four elderly bulls who’s futures were bleak, until BLES reached out to them. We have been busy preparing for the arrival of Nwon, Ngor, Moo and Sompord and are ready to walk with them through the forest between the village of Baan Tuek and BLES on the 1st December! Our most recent rescue, Pretty Permpoon, has literally gone from strength to strength these past few weeks. Permpoon arrived on the 21st October a broken old lady. Unwilling to trust, she would shove us away and refuse to accept our offerings of love and understanding. With ten years of experience under our belt, we all knew exactly what Permpoon needed. She was in need of time, emotional support, unconditional respect and freedom and that is precisely what she got. Yesterday, I sat on the bank by the river and watched some of our elephants play in the water. They grazed on the thorny bushes sprouting all around and took great pleasure in throwing large amounts of wet and sloppy mud all over their heads and backs. The sun was beaming down and the sky was once again alive with dragonflies. As I sat, smiling and watching, one elephant in particular caught my eye. 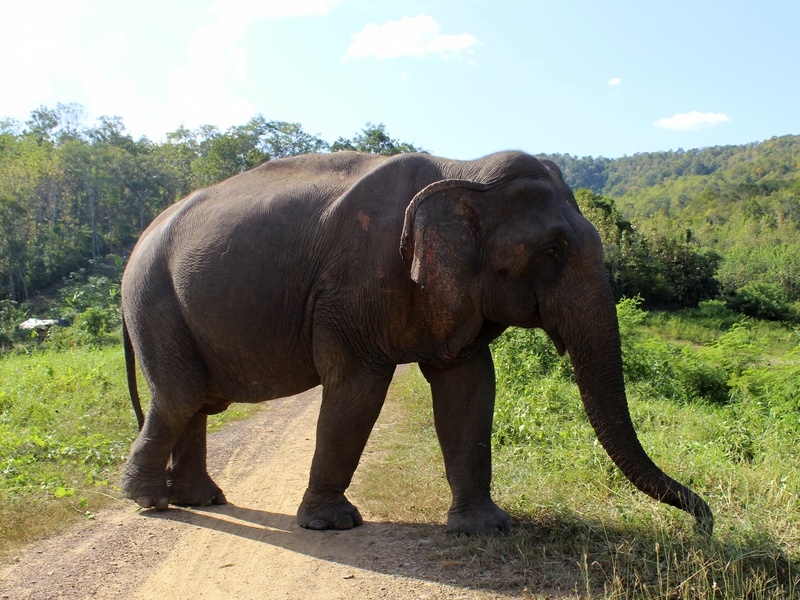 She walked slowly, but confidently from one side of the bank to the other, passing several of our other rescued elephants as she did. 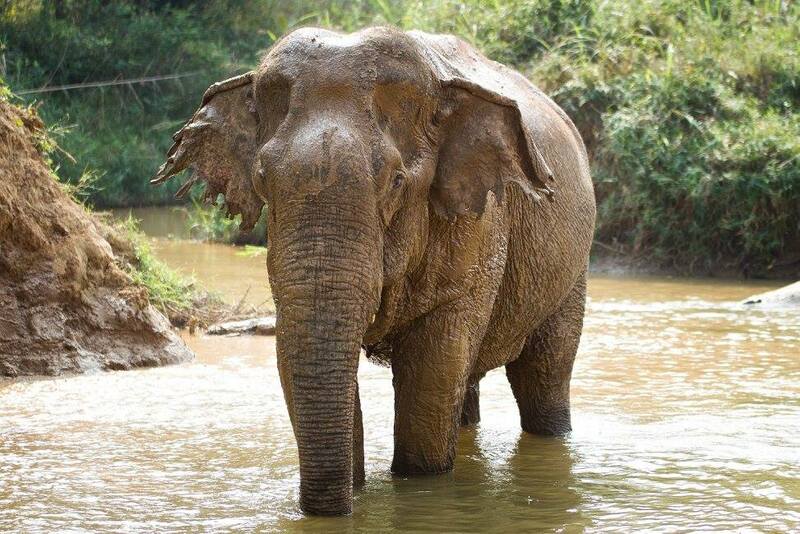 She stopped briefly to exchange trunk touches with Boon Thong and then stood with her feet in the river. She remained motionless for a few minutes, as if she was breathing in the stillness. She then reached in to the water and sucked up a trunk full of glorious mud and threw it over her back, lifting her trunk high in to the air and smiling as she did. The minutes melted in to hours and Permpoon continued to cover her old bones with the river water. Thong Dee joined in and stood beside Permpoon echoing her movements and immersing herself in the joy of freedom. Boon Thong watched on from the shade of the huge bamboo bushes and Pang Suai and Pang Noi gazed over occasionally from across the river as they grazed on long fresh blades of grass. Wassana, Lotus and Pang Dow interrupted the quiet chorus of the birds with their squeaks and grumbles of joy from around the corner, as they splashed and thrashed around in the river and for a minute, I put down the camera, closed my eyes and welcomed the tears that fell. For the first time, in what has felt like the longest time, they were not tears of grief or sadness. They were tears of delight, tears of peace. They were tears full of love, pride and the realisation that life, despite it’s tragedies, does in deed, go on…. I would like to take you on a journey through our local village, to meet some of the residents here. Baan Tuek was founded over 200 years ago and elephants have always been a rich and pivotal part of the traditional culture of this humble, rural village. Typically, the people of Baan Tuek are farmers, growing crops of rice, corn, pineapples, papayas and other traditional Thai fruits. The second major trade in this small village was always logging, using elephants to harvest timber, until the government installed a nationwide ban in January 1989. In Baan Tuek, we still have a small community of retirees and four of them have turned to BLES for help. Four bull elephants, one in his seventies, one is in his sixties, one is in his fifties and one in his thirties, are all living in desperate conditions. The owners, all of them good, kind men, have now got to the point where they can no longer afford to keep their bulls and their options are limited: They could sell the bulls to either tourism camps or logging facilities, but none of the owners want their bulls to be worked. 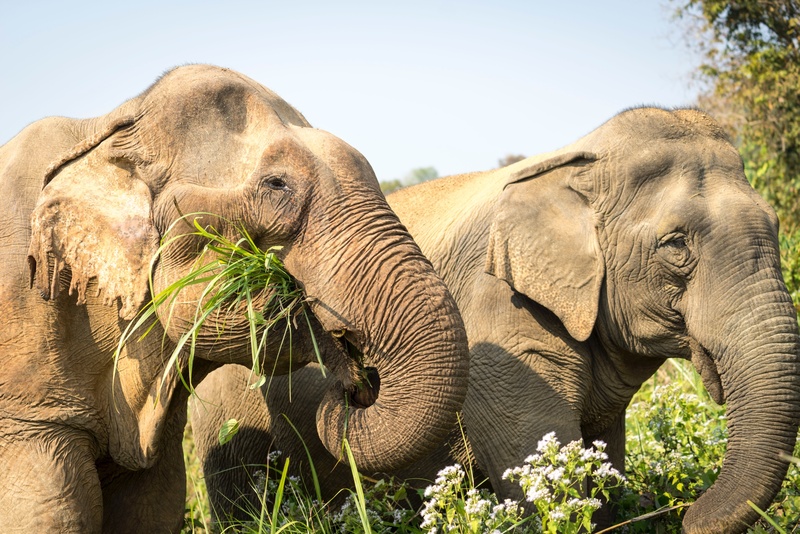 They want them to be able to live like elephants again, to walk freely through acres of protected forested land, to swim in rivers and ponds… In a nutshell – the owners want their bulls to enjoy their retirement at Boon Lott’s Elephant Sanctuary (BLES). Phi Sot’s poignant words have been stirring in my soul ever since and it feels like Somai’s passing has opened a large door for BLES, to unite with the bulls of Baan Tuek and provide them with protection and peace during the last chapters of their captive lives. Seedor Ngor is seventy and has always been a logging elephant. His fragile body shows scars typical of a young strong bull, possibly overworked in the ludicrous logging industry, many years ago. When I first moved to Baan Tuek, over 10 years ago, I remember meeting Ngor and being impressed by his bulk. Anon was helping the owner, Phi Daam, treat a badly infected leg wound, caused by another bull in the village. As I watch Anon and Phi Daam flush the leg wound, I found myself being in awe of the closeness between the three of them. Ngor placed complete trust in his owner and the owner clearly had faith in Anon. There was a unique energy embracing us then and that has remained embedded in my heart all these years on. Phi Daam lives alone, as his wife died of cancer several years ago. He is hard of hearing and has never had a proper job. All Phi Daam has ever known is elephants and logging and having owned Ngor for over twenty years, he is extremely reluctant to sell him on to a tourism camp. Phi Daam loves Ngor very much and wants the best for him. He knows that BLES is the BEST and has long been a fan of our approach to elephant care. Phi Daam has asked us to take in Ngor, so we can give him back what should have always have been his – his freedom. Seedor Nwon is in his sixties and is blind in one eye. He has lived in the village for nearly thirty years and like Ngor, has been worked hard in the trade of timber. Nwon’s owner was electrocuted in a powerful storm four years ago. 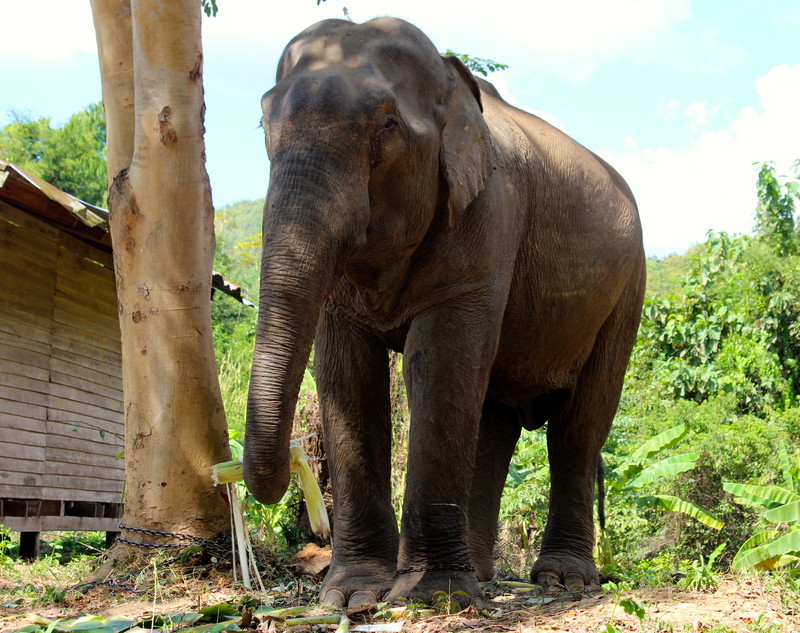 The owner’s family was determined to keep hold of Nwon, who was considered a member of their family and a close family friend, who also had his own elephant, agreed to take on Nwon and take care of him on a day to day basis. That family friend was Phi Nit and his promise to the family has enabled an unlikely friendship to arise between Nwon and his elephant, Seedor Sompord. 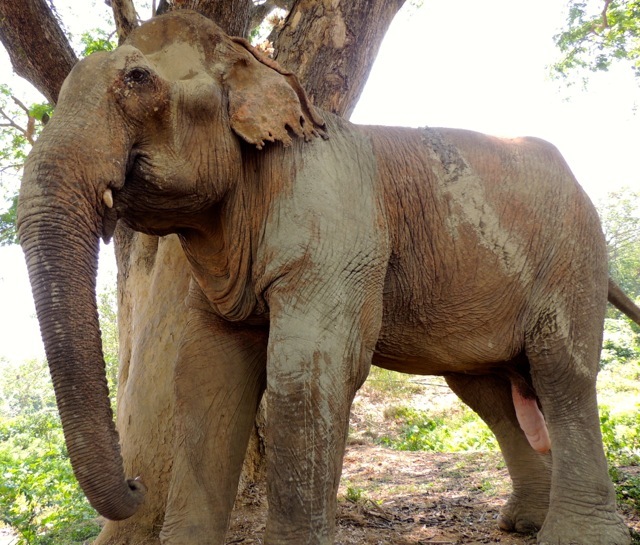 Sompord is in his thirties and Phi Nit bought him from the northern province of Lampang as an energetic fifteen year old elephant. For the past fifteen years, Phi Nit and Sompord have participated in any work they could find – parades, illegal logging and they even did a stint of time in a local tourist camp. Sompord has one leg shorter than the others and was born this way, so any physical labour involving carrying heavy loads, such as tourists for example, would have been detrimental to his health and wellbeing. 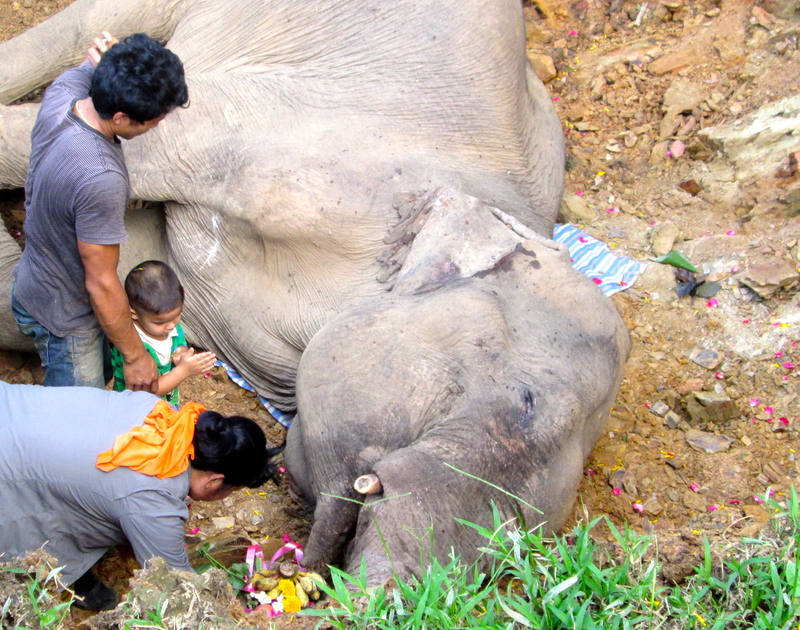 Two years ago, Sompord suddenly became very ill. BLES contacted the elephant hospital in Lampang and paid for the transportation of Sompord to the hospital, so that he could receive life saving treatment. We have maintained a very strong relationship with Phi Nit ever since and are delighted that he has once again, felt able to turn to us for our help. Seedor Moo is in his fifties and is a gentle giant!! His owner, Phi Jud is a lovely man and talks non stop about his ‘brother’ Moo and all his funny habits and quirks. These two have been together for the last fourteen years and when Phi Jud first came to us to tell us he was having to sell Moo to a logging camp, he literally broke down in tears and begged us to help him. We have been having meetings with all the owners in the village for several months now, discussing how we could best help support them and take care of their elephants. Now, two weeks after the great loss of our beloved Somai, we are excited to announce the launch of our new venture to further help our community, in his everlasting memory – The Friends of Somai Initiative! 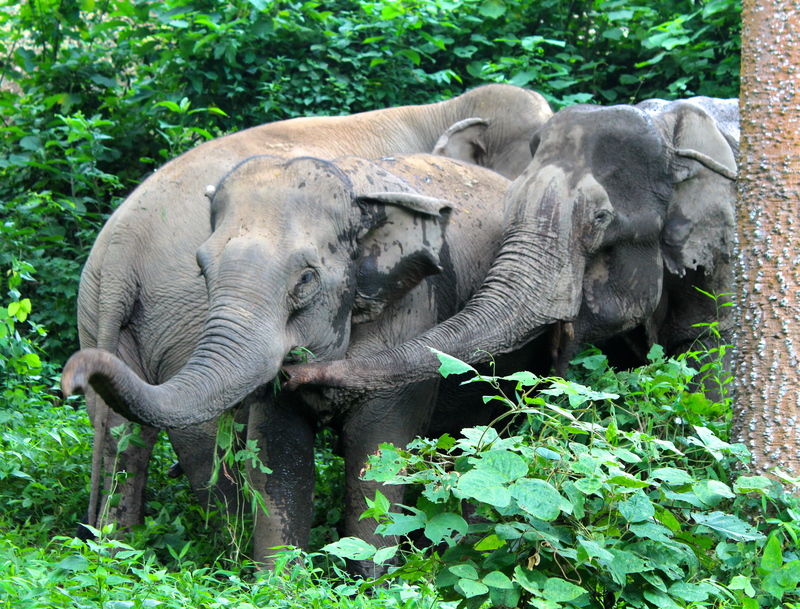 BLES has agreed to take in and fully care for these four needy bulls – Ngor, Nwon, Sompord and Moo and employ their owners to be mahouts at BLES. By leasing these bulls, we are ensuring a livelihood for the owners and reducing the amount of stress involved when an elephant has to deal with a brand new mahout. Their transition to BLES life will flow with ease and we will also be able to offer them a high standard of health care, experienced husbandry skills and a loving approach to their welfare needs. BLES will walk with the bulls through the village, to BLES, which is a distance of 8km. We are eager to welcome the bulls and their owners, but this is going to be a huge financial undertaking and we really do need your help to accomplish this. 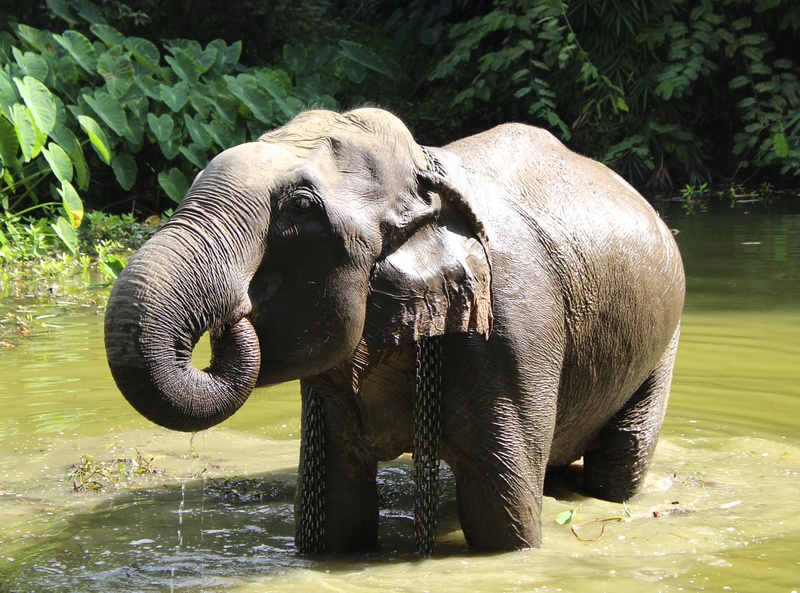 BLES has promised to pay 20 000 Baht a month (365 GBP or 555 USD) per elephant. This is 80 000 Baht (1458 GBP or 2217 USD) a month for them collectively and we are aiming to raise the first three months of funds needed as soon as we possibly can. You can also send a donation via our website -blesele.org and add the comment ‘BULLS’. We can not thank you enough for your constant support and on behalf of the Bulls of Baan Tuek, we wish to express our deepest gratitude for your kind contributions towards The Friends of Somai Initiative. I have no idea how to convey the events of the last 24 hours… We are all still in a complete state of shock, which has shaken us to our very core. BLES is a sanctuary for many different animals, including elephants, cows, pigs, dogs, cats and tortoises. All the animals in our care, become infused in to our family life and each individual touches our hearts in a way only they can. Many of the animals arrive broken. Haunted by the atrocities human’s have enforced on them. The BLES family has years of experience, patience and love to offer all the animals that come our way. Being a part of their recovery is a unique honour and it is a privilege to know these once terrified animals, are able to find it within their hearts to trust and accept us. Working in animal rescue is not easy. There are extreme, joyful highs, and then there are severe, unfathomable lows… Yesterday was a dark day here at BLES. The grief we are all feeling is overwhelming and it is hard to carry on, as we must. 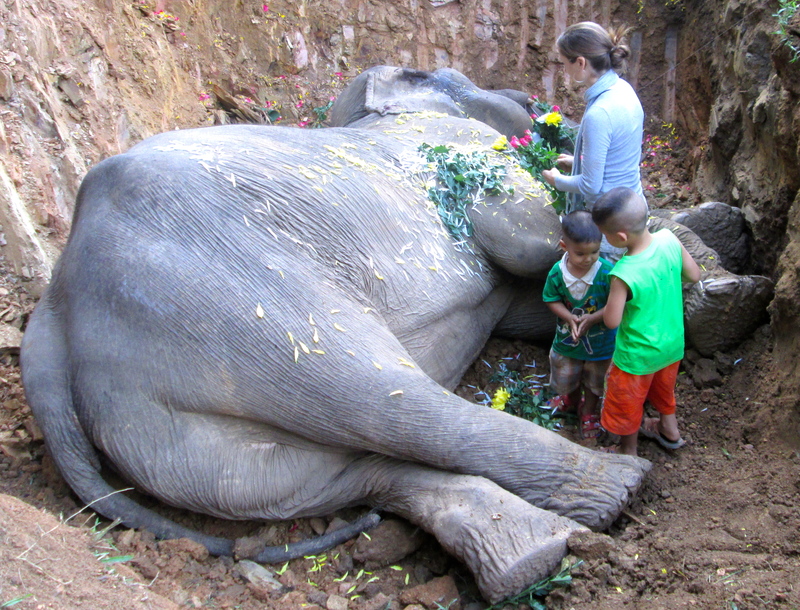 Friends and faithful supporters, there is no easy way to break this news… Somai, the grandfather of our BLES family, our founding elephant, our survivor, our hero, has left this world and joined Naamfon, Boon Mee, Star, Seedor Yai, Somsri, Seedor Gam and of course Boon Lott in the rolling green fields of Heaven. Judging on the position of his body, we believe Somai had been lying down, sleeping. We think he stood up, but lost his footing and his legs gave way from underneath him. This resulted with him landing on his face and chest. As heartbroken as we all are to lose our gentle bull, we are proud he was able to live out the last 12 years of his life in our care. 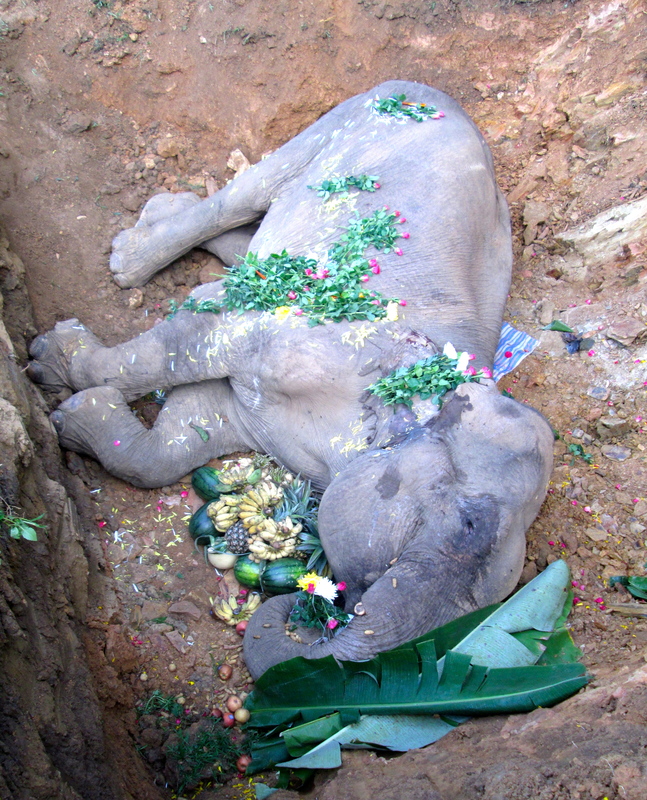 Somai at the grand old age of 68 years old, died of natural causes, in the deep, dense, heart of the forest. He was surrounded by thick bushes, huge trees and there was a fresh water stream just meters away from where he was found. As painful as it is losing a loved one, this is the kind of death we wish for all the animals in our care. We aspire to ensure their final moments on this earth are ones of peace and essence. Every single day, we do all we can within our power to make sure our animals are at one with themselves and the world. Having been a part of Somai’s final years and seeing with my own eyes the satisfaction that oozed out of his every stride, I know that he felt respected and very loved. The two main joy’s in his life were females and food and BLES gave him unlimited access to both! Somai loved nothing more than to flirt his mornings away with Pang Noi and Pang Suai. Somai also enjoyed playful interactions with Lom, but it was always Pang Tong, the mother of Boon Lott, who had his heart. 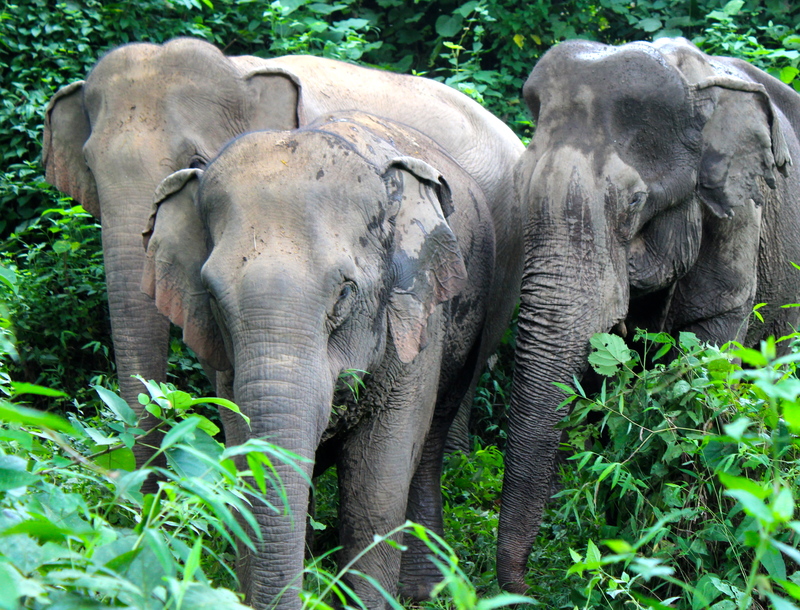 These two wise souls had first met at the elephant hospital back in 2003. Pang Tong was there nursing her paralysed calf, Boon Lott and Somai was admitted in to the hospital with 3rd degree burns, after being stuck in a forest fire. The two elephants struck up a natural friendship that was to last until death parted them – a total of 12 eventful years. In those years, Pang Tong and Somai over saw the erection of BLES. They were guests of honour at the wedding of myself and Anon and have watched our family grow and prosper. 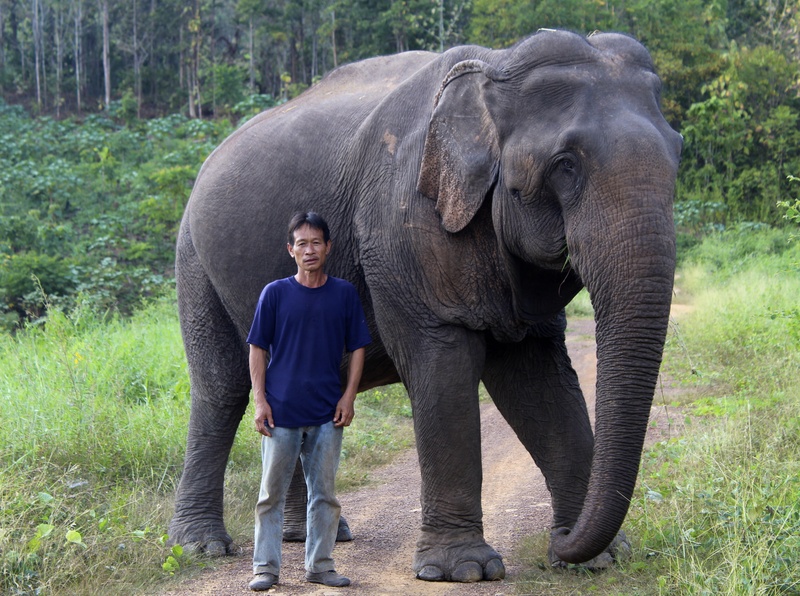 Pang Tong and Somai have been with us, every step of the way during this epic life adventure and I feel infinitely appreciative to have been able to stand in the awesome and impressive presence of Somai. 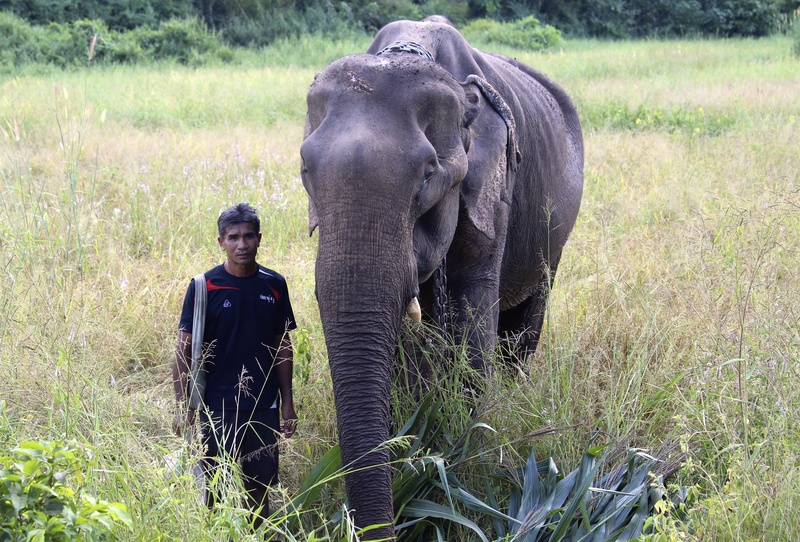 He was a gentle soul and his laid back nature was a credit to the care he received from his faithful friend and mahout, Phi Sot. Somai and Phi Sot were the ultimate duo. They shared a mutual respect and a silent understanding of each other. Yesterday, my heart broke for Phi Sot. A proud man, a loving father, a stable and reliable member of our community, a trusted friend and to me, a valued and cherished advisor – Phi Sot is a genuine and giving soul. Yesterday, we sat together and shared many stories and tears. Remembering Somai throughout the years and all the heartfelt joy he had graced us with. Phi Sot took a deep breath and admitted how much he was going to miss Somai. He said, “Somai has gone to join his friends now. All of them have died long before him and now they are reunited”. 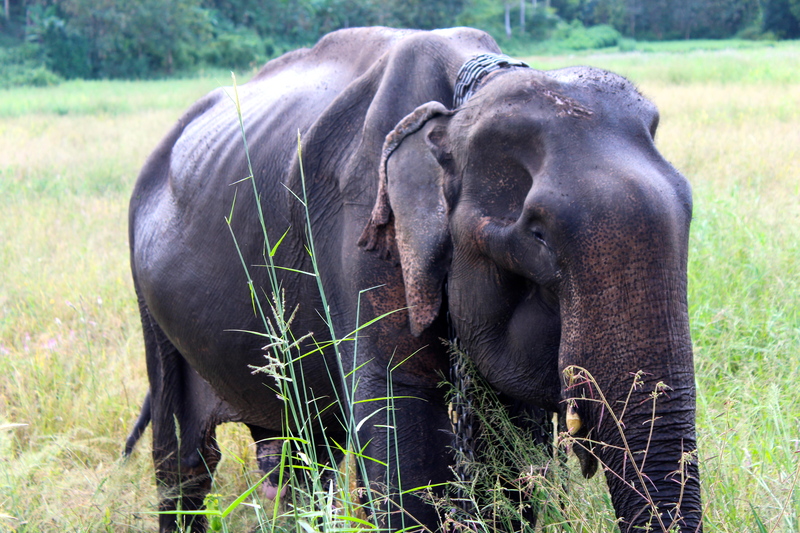 I asked him why he thought Somai had lived so much longer than the other bulls in the village and his answer was simple and sweet – “Because he got to be a real elephant again”. 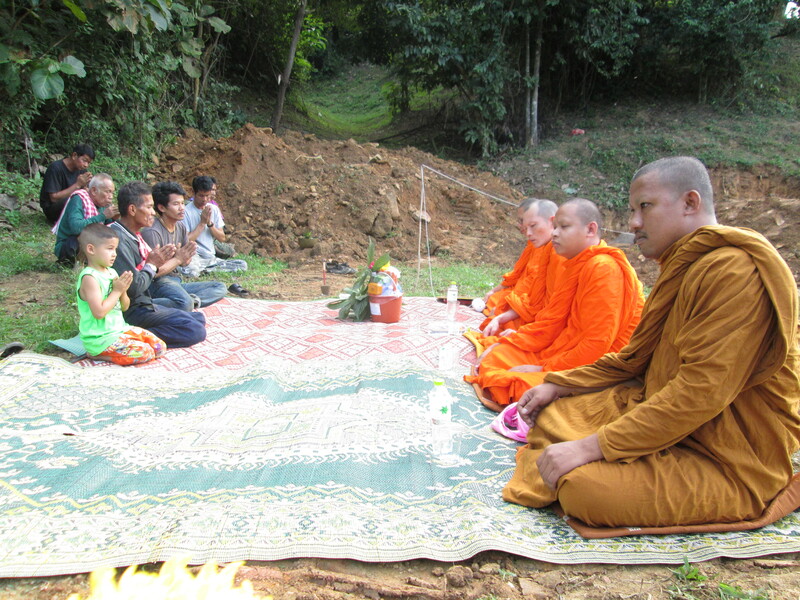 After the monks had chanted and blessed Somai’s spirit, we all lay flowers and fruit on and around his body, saying our own private prayers as we did. I lay down five pink roses – a rose for every one of my children. I leant forward, stroked his face and whispered in his ear, “Thank you Somai, for gifting me with hope, peace, strength, fight and light. Thank you for bringing Anon and I together and for guiding us through the trials and troubles of life. Thank you for being a Father to us all and thank you for allowing us to walk beside you. 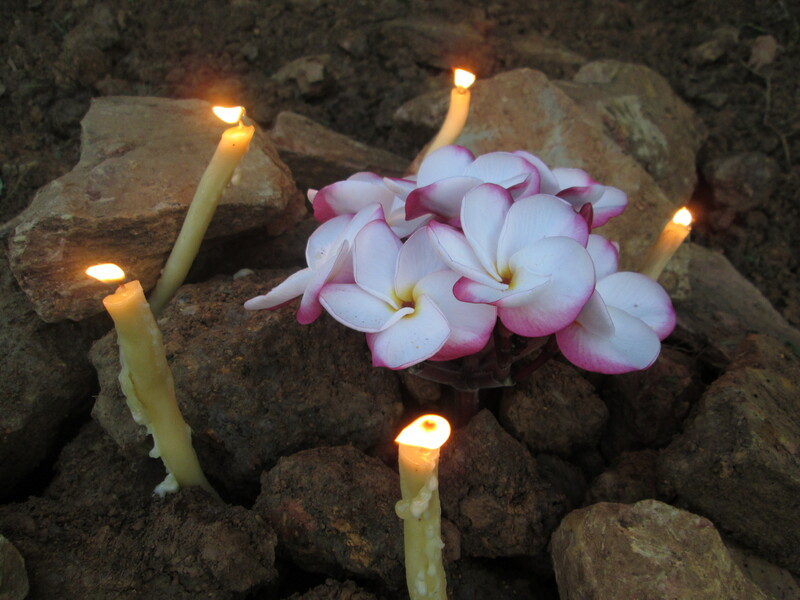 We loved you and we will always love you Somai…. Thank you”. Our sadness at losing Somai was intensified as we also had to come to terms with the loss of three more stunning BLES personalities yesterday. Those of you who have visited BLES will smile with fondness, when you read the following names – Hugh, Marmite and Peanut Butter. My heart aches and my face is wet from the tears that are still falling for these three beautiful boys as I type this. I am so sorry to share the news of their deaths with you. Our dog family experienced the biggest loss in history yesterday and we are still trying to make sense of what exactly happened. Anon took one look at Hugh and Peanut Butter and confirmed my worst fears: The dogs had been poisoned. I gave the baby to Anon and told him to stay with the boys. I ran around the sanctuary calling out for all the other dogs. I could see Choo Choo and Cha Cha. Din, Ommo, Brave Boy and Gumee were all still up in my house. iMac was in his enclosure and fine, though highly distressed at all the drama. I spotted Pizza over by the elephant medical hut and then saw Marmite. Pizza was standing over Marmite and sniffing him. I felt like I was going to vomit and prayed that Marmite was just napping as I charged over to them, but I knew it was too late. Marmite’s body was warm and floppy, but his heart had stopped. He was dead. I carried Marmite up to where Anon was and knew by the look in his eyes that something had happened. He couldnt speak. He just looked down at Hugh’s still and lifeless body – Hugh had died too. I put Marmite’s body down and ran towards the car, yelling out for Honey, Lady and Sarabow. I got in the car and sped out to the village to get some back up. When BLES volunteers Katherine and David opened the door to their house, all I could say was, “I cant find Honey”. The three of us raced back and I pulled over at a neighbouring corn field. I dont know why, but I just had this feeling that one of the dogs would be there. We walked through the corn and then found a body. It was still and black – It was Sarabow! I ran and scooped her up in my arms and then lay her down on the road. She was alive, but also fitting and foaming at the mouth. At the same time, Anon appeared holding a cat’s stiff carcass and Katherine and Hope ran down holding Honey, with Lady in close pursuit. We quickly identified that the cat was not one of ours and then rushed everyone back to BLES. Lady was fine and showed no signs of poisoning, but Honey was shaking uncontrollably and had nothing but fear in her eyes. One of the housekeepers came down and announced, with tears in her eyes, that Peanut Butter had died and I decided to rush Sarabow and Honey straight to the vet. It felt like the longest drive and Sarabow continued to have seizures. As soon as we got to the practice,the vet put Sarabow on fluids and gave both Honey and Sarabow an injection of Xylazine to make them vomit. Honey was sick, but Sarabow wasnt and so the vet pumped her stomach with charcoal. Her eyes were wide and glazed over. Her breathing was erratic. David and I held on to Sarabow and Katherine stayed with Honey, keeping her calm and monitoring her breathing. As I held Sarabow’s beautiful black face in my hands, I heard the driver’s phone ring and a sudden feeling of anguish rushed over me. I stepped outside, saw his face and all he said was, “It’s Somai”. Not knowing if our two girls were going to pull through or not, I had no choice but to leave them there and rush back to BLES to Somai. Words can not express my gratitude to David, Katherine and Dr Penny, for staying with Sarabow and Honey and for seeing them through the treatment. Honey was lucky and could only have consumed a small amount of poison. She is thankfully, now well and back to her usual bouncy self. Sarabow, however, must have swallowed more as she is still not out of the woods. She is desperately weak and so far, has not eaten anything. We are currently monitoring her 24/7. From what we can gather, one of our neighbours had been spraying pesticides on their corn plantation and the container had leaked. Not realising the danger, the farmer did not clean it up and then sadly our dogs, unknowingly, went for a morning play around in that very corn field and were exposed to high, concentrated amounts of the pesticide. As I sit here, typing up the events as they unfolded, I still find myself in utter disbelief. Life is so sacred and can be snatched away from us in an instant. Yesterday we lost four mighty and impressive beings. We are all mourning their unexpected deaths and feeling a huge loss within our family. BLES has been left feeling empty and we feel so sick about what has happened. The Universe obviously has a reason for all of this, but I cant help but feel demoralised about it all. So many deaths, in such quick succession – it is heart breaking beyond belief. This is why I turn to you, our dear friends around the world and ask for you to hold my team, my family and animals in your prayers. We are strong, but this has knocked us emotionally. Please think of us during your meditations and surround us with white, healing light. BLES has had a very tough time lately and yesterday will always be referred to as ‘The saddest day in BLES history’.